The summer holidays are here! And as teachers and school students alike look forward to the long summer break Lancashire Fire and Rescue Service are gearing up to promote summer safety messages throughout the holidays ahead of a new education programme set to launch at the end of summer. Sch ool’s out and for the younger members of our society that means 6 weeks of lazy days and holidays and perhaps the odd sleepover? Sleepovers present a particular hazard when it comes to fire as often people forget to share their fire escape plans with visitors. 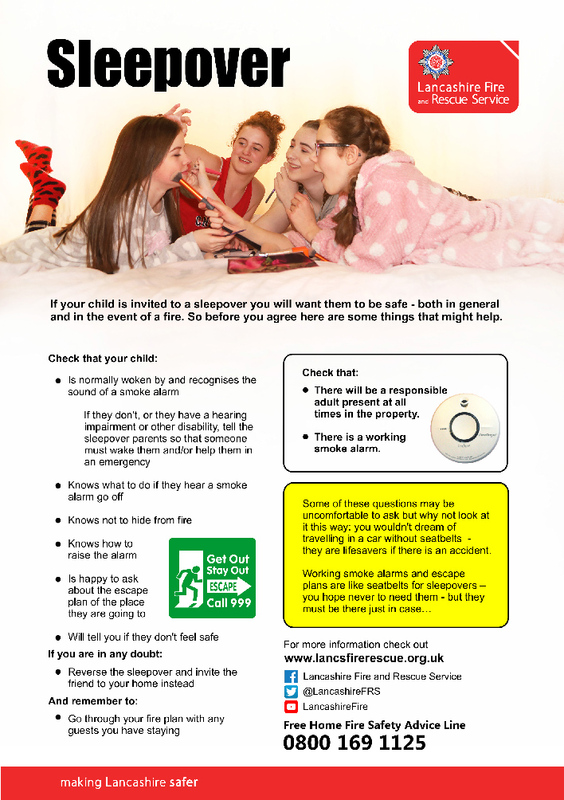 To help raise awareness of some good sleepover practice Lancashire Fire Rescue Service have compiled a leaflet offering some sound safety advice and thoughts to consider should you host or allow your child to attend a sleepover. These leaflets will be available at various community centres and public locations over the summer but you can also get your hands on a copy here to! It’s not just fire safety in the home that the Fire and Rescue Service will be looking to promote over the break but water safety, cooking safety and grass fire awareness too. “The main message to our young people this summer is stay safe! We’ve been experiencing some really warm, sunny weather recently which makes for great summer holiday fun but we would urge people to be mindful of the consequences of their actions. We understand that reservoirs and rivers can look like tempting places to cool off but swimming in open water can be very dangerous and has in recent years has led to the deaths of several Lancashire teenagers. Our advice would be to observe any warning signs that are in place around Lancashire’s open water sites and only swim at designated sites. All these safety messages and more form part of a new education programme targetting year 7 students, which the service will be offering to all secondary schools in the county from September. Further information on this programme will be released in due course.